Conflict and violence displaced more than 68 million people in the past year, and half of those are children. We refuse to accept conflict as a way of life. Rotary projects provide training that fosters understanding and provides communities with the skills to resolve conflicts. Through our service projects, peace fellowships, and scholarships, our members are taking action to address the underlying causes of conflict, including poverty, inequality, ethnic tension, lack of access to education, and unequal distribution of resources. Happy Birthday Rotary. This month is dedicated to the celebration of peace and the 114th anniversary of the founding of Rotary International on February 23rd - World Understanding and Peace Day. 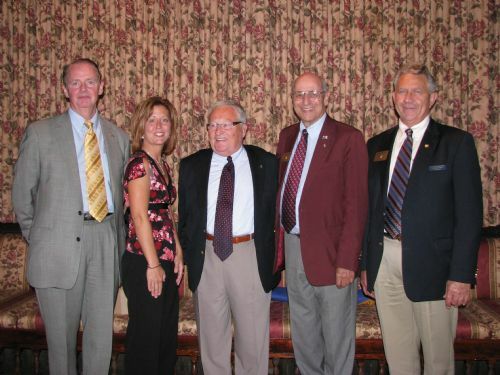 I don’t believe Rotary’s founder, Paul P. Harris, or our own Arch C. Klumph, Father of The Rotary Foundation, had any idea at the time the true significance of their visions for “Service Above Self” and “Doing Good in the World” and the impact they would have on this world for generations to come, for all eternity. Polio eradication, the largest global public health initiative in the world, contributes to peace each and every day. Bringing light into some of the furthest outreaches of the world, and yes, Rotary does stop wars to immunize its children. Rotary’s Peace Fellowships. In just over 10 years, the Rotary Peace Centers have trained more than 1,200 fellows. Many of them now serve as leaders at international organizations or have started their own foundations. Our district was at the forefront of the formation of this program when 2000-2001 District Governor Jim Frame of the Rotary Club of Mantua stood on the stage at the RI Convention in San Antonio representing us as one of the few charter districts from around the Rotary world who supported the development of the World Peace Fellow Program. Rotary Youth Exchange builds peace one young person at a time. The long-term exchanges represent a full academic year and the short-term program can take the form of several days up to three months. There is no better opportunity for our youth to experience another culture, learn a new language and develop life-long friendships all under the umbrella of the Family of Rotary. Our community and university-based Rotaractors (ages 18-30) are part of a network of over 10,904 Rotaract Clubs representing over 250,000 Rotaractors in 189 countries and our Interactors (ages 12-18) are represented by over 20,372 Interact Clubs with 468,556 members in over 159 countries. When our Interactors reached out to the youth in hurricane-ravaged St. Thomas, with the help of Rotary clubs throughout the district, they raised over three times their initial goal of $10,000. This $33,000 resulted in the development of a Global Grant worth $141,000 sponsored on their behalf by the Rotary Club of Chesterland. It helped rebuild their library for their high school and the community. Just another example of reaching out with understanding and support make their “world” a better place. Our Rotary Youth Exchange Students, our Rotary Peace Fellows and our Interactors and Rotaractors…these are our peacemakers and they do change our world. Many of you may remember Mother Teresa has had a profound effect on my life and I wanted to share with you one of my favorite quotes and the significance of a world without peace. As a Nobel Peace Prize recipient in 1979, she devoted her life to working with the “poorest of the poor” in the slums of Calcutta and donated all of her winnings to those she served. Mother Teresa continues to be an inspiration to this day. 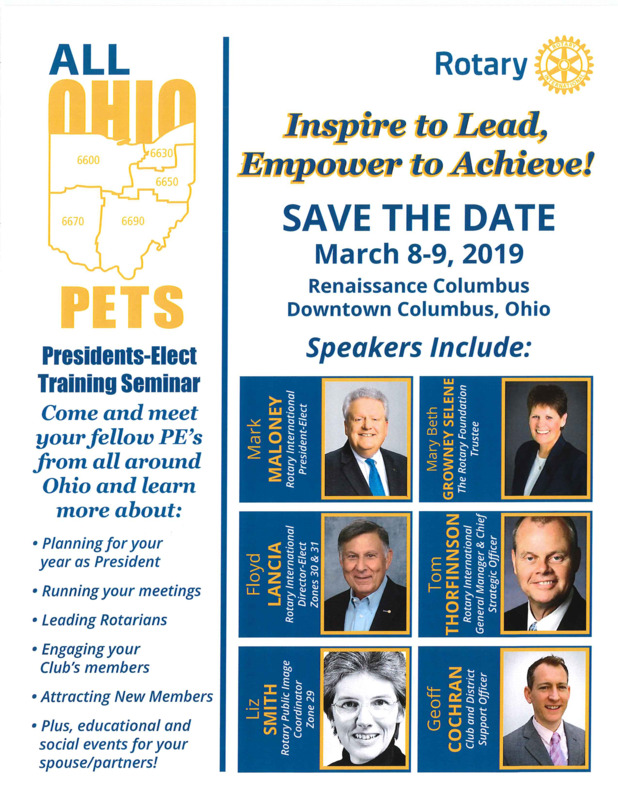 I couldn’t be more excited about the upcoming District Conference of Clubs, April 12-13, 2019 at the Cleveland Airport Marriott. 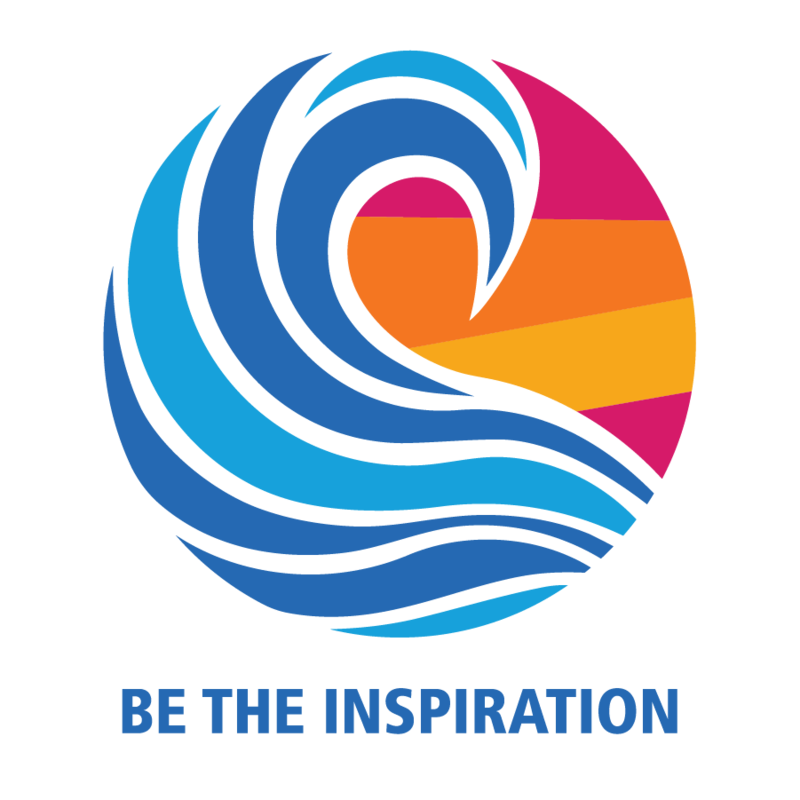 Woven throughout the mosaic of the weekend will be RI President Barry Rassin’s theme of “inspiration” with a “touch of the Islands” throughout. We have assembled one of the finest Planning Committees – ever – led by District Conference Chair Julie Brandle of the Rotary Club of Akron. As our Club Presidents already know, this year we will be holding the Celebration of Life on Friday, before the Annual District 6630 Business Meeting, effectively reducing the conference by a day and giving more of the Family of Rotary the opportunity to remember those we have sadly lost in the last year. Friday’s speakers will include Special Agent in Charge Eric B. Smith, FBI – Cleveland Division and we are awaiting final confirmation of attendance by one of the “Children of the Dump” from Nicaragua who is now in college; a shining example of the result of the support provided by so many clubs in our district for the Shoebox Program. Our afternoon education sessions will lead off with a panel of Rotarians representing some of best “new member development and engagement programs” this year in our district. PDG Membership Chair Jim McKee will be announcing winners of the Tri-District Membership contest at lunch. 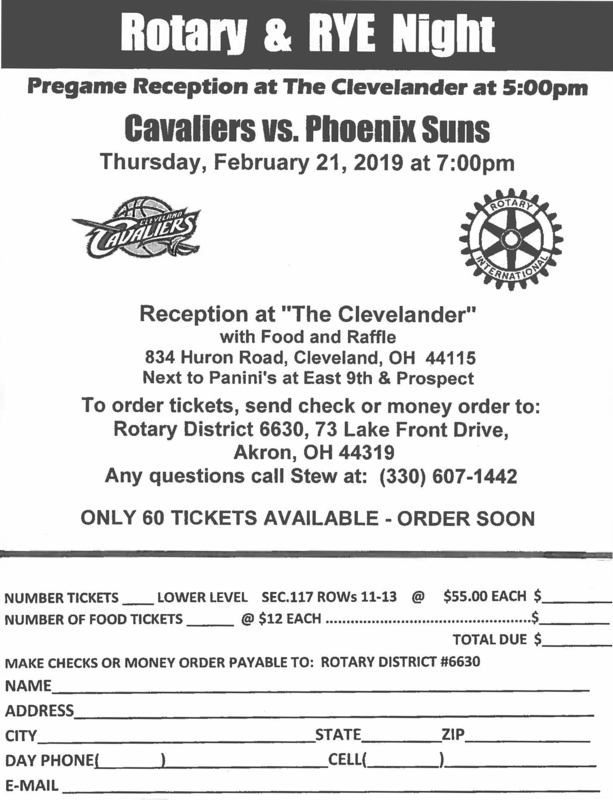 Friday evening will conclude in the Hospitality Suite sponsored by the Rotary Club of Chesterland. Saturday morning begins with the District Leadership Assembly featuring a wide-array of programming for all Rotarians and guaranteed to Inspire to Lead - Empower to Achieve…And Have Fun. 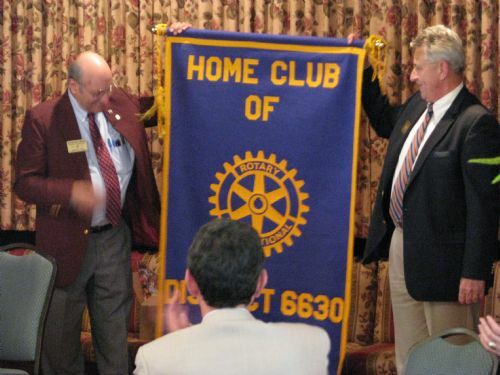 Watch for further details that will be forthcoming in the near future from the District 6630 LEAD Committee co-chaired by PDG Steve Zabor of the Rotary Club of Mantua and Ryan Knotts of the Rotary Club of Hillcrest Sunrise. Saturday’s luncheon is a Celebration of Youth featuring our Rotary Youth Exchange Students, a presentation by the District 6630 4-Way Test Speech Finalists, Charter Ceremony for new Interact and Rotaract Clubs and a segment on our Rotary Youth Leadership Awards (RYLA) camp – all guaranteed to inspire you. As of press time, special plans are “in the making” in the hopes that we can bring one of the Interactors and an adviser from the Ivanna Eudora Kean High School in St. Thomas, US Virgin Islands, the beneficiary of the Global Grant Literacy Project, to meet in person our Interactors to share what it means to have their support and their outreach. And further late breaking news…Dave and Laura Diffendal of the Rotary Club of Cleveland have generously offered to provide four nights at one of their “incredible” resorts in Belize as an auction item on Saturday to provide further support for Polio Eradication. Saturday evening will give us the opportunity to honor those who have recently become Major Donors to The Rotary Foundation and the chance for an update on the “53,000 Points of Light” Polio Eradication Initiative. 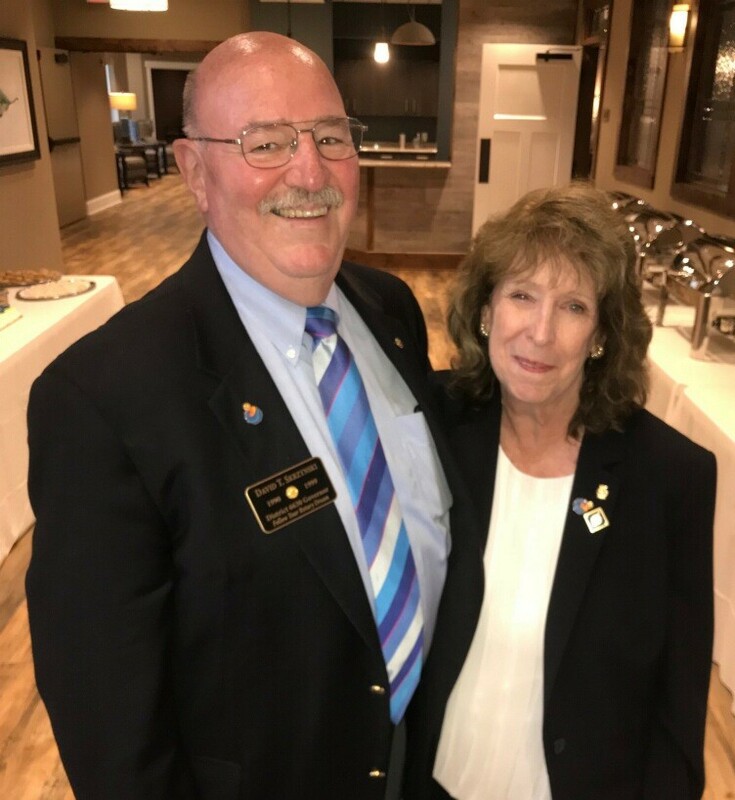 We will also be welcoming PDG David Bixler and Julie from District 6080 in Missouri as the RI President’s Representatives for President Barry and Esther to this year’s District Conference of Clubs. PDG David is his district’s Rotary Foundation Chair and Zone 31’s Assistant Rotary Public Image Coordinator. I know we all look forward to welcoming them to our Rotary Family. Above is a brief overview of the proposed schedule of events for the District Conference. Please enjoy this month's record breaking 23 page Rotary District 6630 Newsletter (Click to open/download). Thanx to all those who contributed. Keep in mind the deadline for the January edition will be 1/12. Be sure submit to me at stonecut@sbcglobal.net and be sure to include Article for District Newsletter in the subject line. Have a Merry Christmas and a Healthy Happy and Prosperous New Year! Each of us receive so many letters at this time of year asking us to “open our hearts” and please give special thought to those in need. 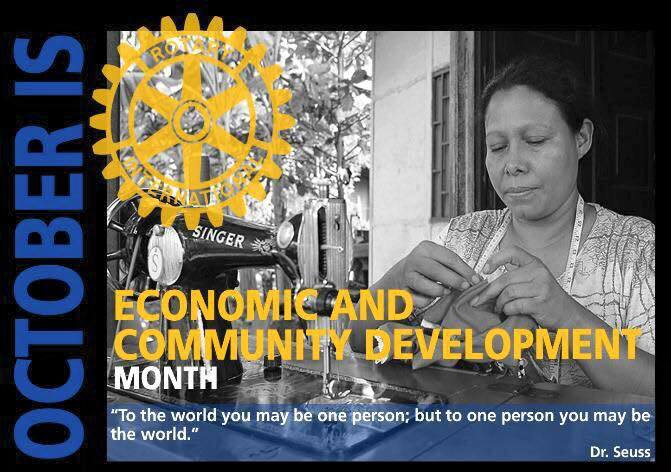 But that is what Rotary does each and every day of the week… during every month of the year. Thank you to you and your families o n behalf of all those you serve. One of our greatest strengths… our secret weapon, is us and how we lead our lives, how we treat others and how we shine the light on those in need – that is our gift to the world and no one does it better. On our computers, iPads and phones we continuously see opportunities to “press here to donate,” “click here to give” and “push here to contribute.” We have those same buttons in Rotary, but on the other end is your Foundation doing your work through your club in your community and around the Rotary World. We will End Polio Now…as we continue to dig wells to bring fresh water to those who have none — so food can grow and people can eat and our children can learn and make their way toward a better life. That is just a sampling of who and what we are. We had a record-breaking turnout for the December 6th Foundation event when we came together in friendship for fun, great food AND desserts to truly celebrate “Doing Good in the World” (see the article on page 3. 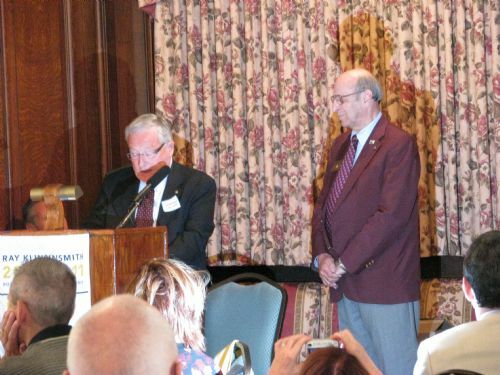 The highlight of the evening was when John Daily of the Rotary Club of Akron was inducted into the Arch Klumph Society of The Rotary Foundation. John is pictured here with Frederick T. “Rory” McGuire, the grandson of Arch C. Klumph, and Kevin Kelly, Zone 29 Major Gifts Officer. Our Rotary Family, as always, demonstrated incredible generosity and on behalf of PDG Amy Kapostasy and myself, thanks you to everyone who had a part in its success. SAVE THE DATE for the 2018-2019 District Conference of Clubs, April 12-13, 2019 at the Cleveland Airport Marriott (an undiscovered jewel of a property) when we will come together once again as People of Action. At the end of my letter are just a few of the ways Rotary touches the lives of others that I once shared with my own club and with the 2018-2019 Club Presidents as we prepared for this year – these Rotary leaders are truly my personal Inspiration. I wish each of you and your families and friends, Peace, Joy and Hope. These to me are Rotary’s most precious gifts offered by each and every Rotary club in this district, and the men, women and our Rotary youth who give so much of themselves in so many ways. I know that to be true because I have seen it first-hand. When that life-saving drop is placed in the tiny mouth of the infant whose trusting mother smiles with tears in her eyes, and then embraces you with a strength that you can’t even fathom — that is Rotary. We are excited to host our first Information Social Hour for prospective e-Club members! Meet others who share your passion to join leaders and serve the community through Rotary. Yes, it's not online - it's in person! Hard to imagine that Thanksgiving is here already! Hope you and yours have a happy and healthy one. Please enjoy this month's newsletter (CLICK HERE). Thanx so much to all of you that contributed. Be sure to send all submissions to me at stonecut@sbcglobal.net . BE SURE TO INCLUDE "Article for District Newsletter" in the subject line. The deadline for the December Newsletter will be Dec. 14th. After just a little over two months into this Rotary year it is YOU, the Presidents and your Rotary clubs, that keeps me energized and focused. The Rotarians and their families are People of Action of the first order and each of you have hit the ground running in your projects and activities. I have been welcomed with such warmth at each of my club visits – it is absolutely the best part of being your District Governor. The plans that many of the clubs have shared with me for membership development and engagement are outstanding (please see the September message that appeared on Facebook from President Barry on page 13 of the newsletter). I have watched with interest and pride at the new member inductions that are already taking place in this new Rotary year - some of which I have been honored to take part in. The next step of course is engagement and leading them to their own “Rotary Defining Moment” (see page 2 for this month’s example). September is “Basic Education and Literacy” month. More than 775 million people over the age of 15 are illiterate. That’s 17 percent of the world’s population. 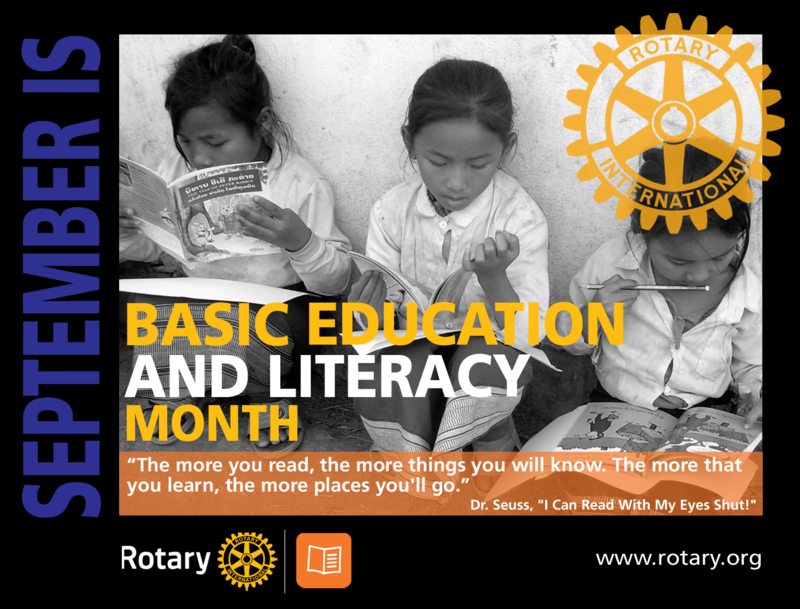 Rotary’s stated goal is to strengthen the capacity of communities to support basic education and literacy, reduce gender disparity in education and increase adult literacy. Every club in this district is engaged in some way in this important Area of Focus. Every time you mentor one of our youth…work with advocates to offer a community literacy program for adults…provide a scholarship….sponsor a 4-Way Test Speech Contest….put a dictionary into the hands of a young child…host a Free Little Library…or read to a senior whose eyes can no longer see…that is the Gift of Rotary. The initiative launched last month to seek out our Rotary Alumni within our clubs is taking form and an important part of my Governor’s message as I make my visits. Please see the article on page 7 that talks about “Rotary Reconnect Week” scheduled for October 1-7 that ties directly into our efforts. 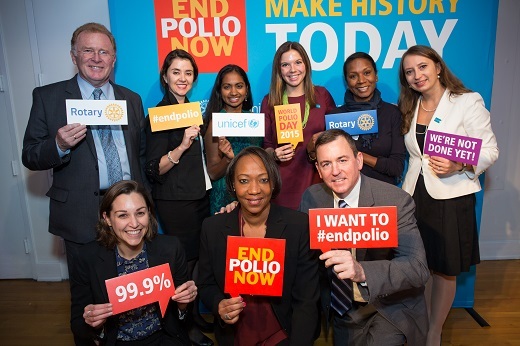 Find these young people who were the beneficiaries of your club’s programs and see if Rotary is still a part of their lives and if not, find out why! Our Interactors, Rotaractors, Youth Exchange Students and former GSE and Ambassadorial Scholars, for example, are ALL critical to the future of Rotary and integral to world understanding and peace. Thank you for Being the Inspiration to me. Please enjoy this month's Rotary District 6630 Newsletter (click here to view full issue). Thanx to all those who submitted content. Every Rotarian and Club leadership team is encouraged to share the newsletter with their prospective members and any other mailing lists which could include that of former members, friends etc. Keep in mind that the deadline to submit articles for the October edition will be Friday, October 12th. I am privileged to have already been a part of so many different club events and as I began my official visits, I am finding energized clubs who are working hard, having fun and simply enjoy being with each other and have firm plans in place to do more. This doesn’t happen just by chance, but because we have engaged and informed Rotarians who have a passion for what they are involved in and are supporting. 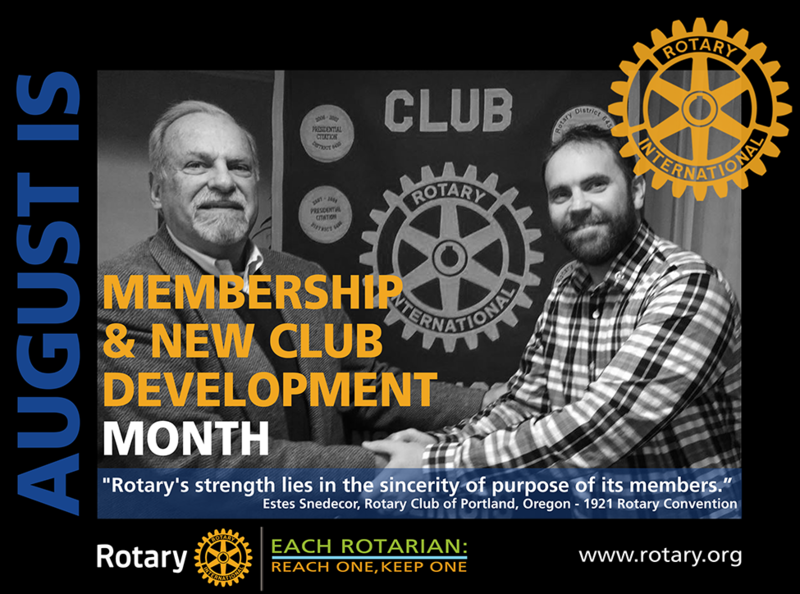 August is Membership and New Club Development Month. This is something that is everyone’s responsib ility – not just the president or club membership chair – and should be part of everything we do each and every month. Rotarians are People of Action and the busiest people I know. As with anything, if we find the value in what we are doing, we make the time to do it. See this month’s “My Rotary Defining Moment” on page 3 - these are the types of messaging we should be sharing when describing what Rotary means to each of us. Many times the reasons we have stayed in Rotary are not why we initially joined. See RI President Barry Rassin’s membership message on page 10 and the RI Membership Minute for August on page 4 that highlights many of the same ideas and tools that we have shared with our presidents over the past year. As a reminder, Rotary has a series of membership courses available in the new Learning Center and all these resources and more can be found at https://www.rotary.org/membership. Don’t forget to follow-up on those membership leads that are being forwarded to your club about individuals who have asked to be contacted by an area Rotary club to become involved. During my visits some of you have heard me speak about the importance of seeking out our Rotary “alumni” to find out what they are doing and if Rotary is in their lives and if not, why not! On page 5 [of the August newsletter - CLICK HERE] is the launch of that initiative. Our youth who are the graduates of our programs and beneficiaries of our Rotary support are our future in the United States for membership growth. Let’s find them and then never lose contact with them again. In the September newsletter another “new” approach to membership extension in our district will be focused on. Interact is continuing its growth with three new clubs on the horizon and plans are underway to expand Rotaract in our district. During this month we will be finalizing plans for a regionalized Membership Summit joining together with neighboring districts. This will be by no means a singular approach – we will follow this up with our own programming tailored just for our district. This cannot be accomplished in just one year as you all know – it will be a multiyear effort and beyond. A number of you have asked to see the agenda from our July “brainstorming” meeting and I have attached it so you can “make it your own” when doing your own strategic planning for membership development and engagement. Be sure you take the time to write your own Rotary story – your own defining moment and your own INSPIRATION. Share this gift of Rotary with someone else. As of press time, the Charter Celebration of the Rotary Club of Green of August 10th has just occurred and was an outstanding success! We were honored to have Rotary International Director Robb Knuepfer, Jr. in attendance to conduct the Charter Ceremony and induction of Charter Members. I was honored to induct President Kristen Lewis and her 2018-2019 officers. 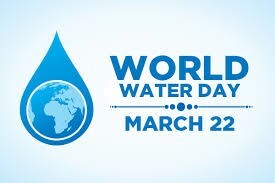 Congratulations Rotary Club of Green, Ohio USA! What an incredible way to start out Membership and New Club Development Month with this new addition to our Rotary Family that was a direct result of a partnership between our district and District 6650! I encourage you all to take a moment to reach out to and welcome them to Rotary. Happy New Year to the Family of Rotary of District 6630! Rotary Year 2018-2019 has kicked off with excitement and a true spirit of inspiration. The Rotary clubs in District 6630 haven’t missed a beat and I have already witnessed firsthand what I already knew – that we are the premiere district in the level of our dedication and commitment. 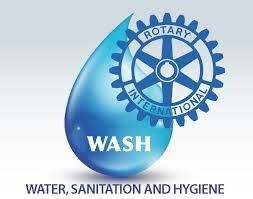 There is not a day that goes by that a life is not better for having been touched by Rotary. I am honored to be your District Governor and privileged to be guided by a team of Club Presidents “on the move” who are truly People of Action. They are a force to be reckoned with…they are energized and committed to working hard and having fun while doing it. They are diverse in almost every way imaginable representing a multitude of generations, vocations and avocations… all with a single goal in mind. They all want to leave this Rotary year a little bit better than they found it and it is my goal to help them do just that. When you receive their call – please answer it. They can’t succeed without you and I can’t do it without them. Rotary International President Barry Rassin “believes Rotary still is the organization Paul Harris originally envisioned…a place where people from every corner of this earth can come together to become something greater than themselves.” He wants the impact that we have on our communities and around the world to be sustainable and is committed to strengthening our public image and the use of digital tools to maximize Rotary’s reach. 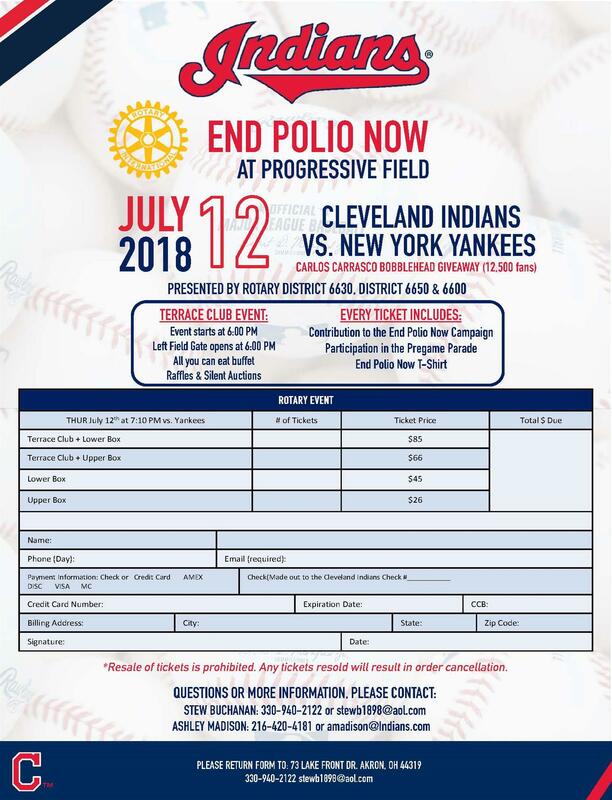 Our District 6630 kicked-off the new Rotary year on July 12 with our annual End Polio Now event at Progressive Field with the Cleveland Indians! Once again, the Children of the World “won” because of your generosity even though the Indians didn’t. Those darn Yankees! We are so appreciative of the participation from our surrounding sister districts, but especially District 6650. Last Thursday, July 19 was a wonderful gathering of the Family of Rotary and the incredible leaders we have in our district. Governor Amy (2017-2018) and I appreciate so many of you being in attendance to honor those who were committed to Making a Difference last year and to celebrate those who will Be the Inspiration in 2018-2019. It was also a very special opportunity to be able to recognize and honor so many of our Past District Governors and their spouses and partners who have stood by their side. The August Newsletter will include coverage of the event! 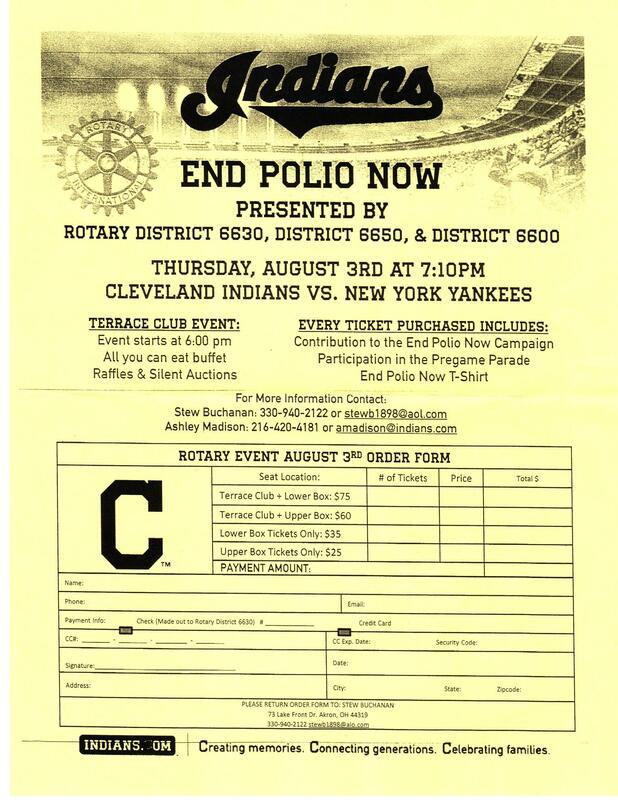 Thank you to my Home Club – the Rotary Club of Cleveland - for all your support. We have another extremely important celebration coming up that doesn’t occur very often within the life of a district and that is the chartering of a new Rotary club. Please come and support the Rotary Club of Green on Friday, August 10. 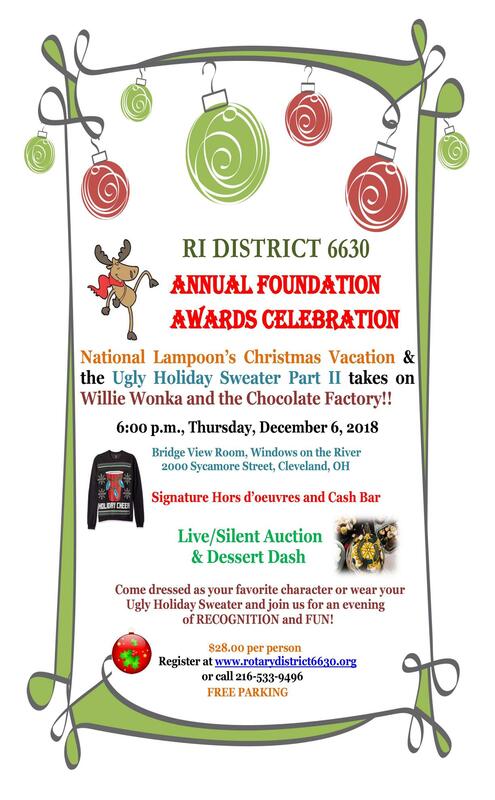 We are honored that RI Director Robb Knuepfer will be in attendance to officiate over the charter ceremony. This is a unique example of membership extension as it is a result of a partnership between District 6650 and District 6630! All the details are located on page three of the newsletter. Since I promised our Club Presidents “the how” (they already know “the what and the why”) we kicked off the year with the first of several membership initiatives by conducting a brainstorming session on the “state of membership” in District 6630. We will be sharing these results with you as well as the plans that are in process for a regionalized Membership Summit joining together with Districts 6600 and 6650. In the meantime, a recommendation they felt particularly strongly about was to include in our monthly newsletter, effective immediately, a feature entitled “My Rotary Defining Moment.” This is that moment in time in our Rotary journey when it became clear as to what Rotary truly means to each one of us – why we stayed, what ignited our passion and inspired us to do more. And isn’t that what we should each be doing...helping our new and newer members to find their own Rotary Defining Moment? See page thirteen for the first installment! Our August newsletter will contain information about additional district programs that support membership development and engagement. Rotary started paying it forward about 100 years earlier than it was fashionable…we not only join to serve a need in our communities and around this incredible and challenging world of ours…but we also join to take care of each other and we always receive more than we could ever give. That is what a family does. That is the gift called Rotary. Welcome to the new Rotary year. Best of luck to all you new leaders. Thanx for your service. Please enjoy this edition of the Rotary District 6630 Newsletter (click to view). Thanx to all those that contributed. The deadline for submissions to the August Newsletter will be August 10th. Be sure to put "Article for District Newsletter" in the subject line. 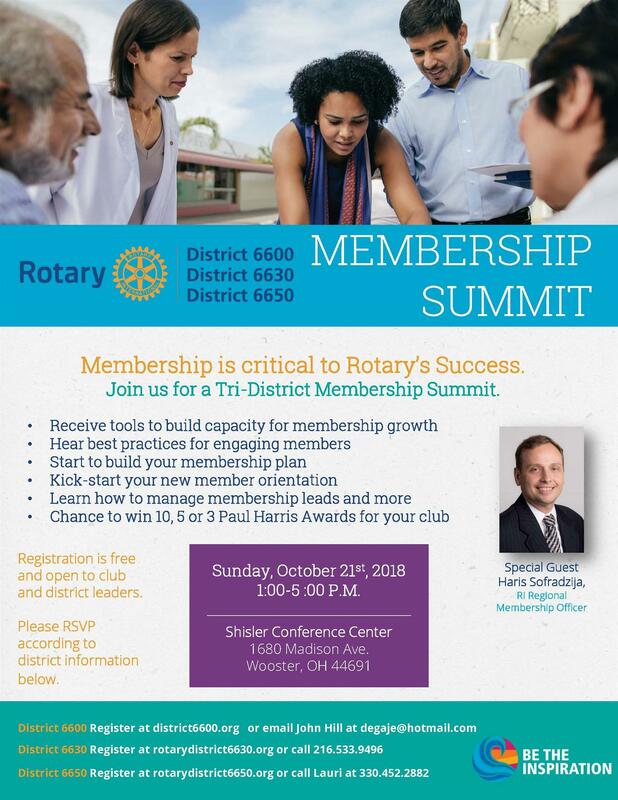 Please enjoy the final District 6630 Newsletter of the 2017-2018 Rotary Year (click to view). I hope your club had as successful a year as our club did. Congratulations and heartfelt thanks to all those who served in a leadership position over the last year. Best of luck to those who are beginning their leadership year. Thanks to all of those who contributed to this month's edition. The deadline for the July edition will be 7/21. Please enjoy this month's Rotary District 6630 Newsletter (click to open). Thanx to all those who contributed. The deadline to submit for the June Newsletter will be 6/22! Please enjoy this month's Rotary District 6630 Newsletter (click to open). Thanx to all those who contributed. Please enjoy this month's Rotary District Newsletter (click to open). Thanx to all those who contributed. The District Governor's letter for February will follow under separate cover. The deadline for the March Newsletter is 3/16. 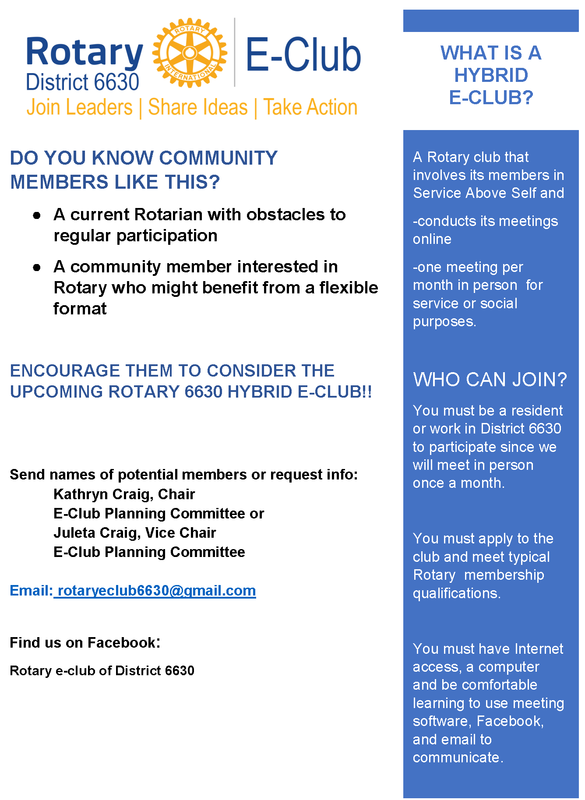 Hope you enjoy this month's Rotary District 6630 Newsletter. Thanx to all those that contributed. For those that haven't, what's stopping you? What's your club been up to? Have an upcoming event that you would like other Rotarians to support? Let us know. If you are putting your event into your Club's website powered by ClubRunner, be sure to click "Show Event on District Website" and it will be automatically placed into the Club Calendar of Events on the District site. But also send it to me and it will get added exposure in the newsletter. The deadline for February edition will be February 16th. FIRM FIRM FIRM! Merry Christmas and a Healthy, Happy and Prosperous New Year! Please enjoy the last District Newsletter of 2017 (click to view). Thanx to all who contributed to this edition. The deadline for the January edition will be Jan. 19th. Please enjoy this month's newsletter. Click to view. Interaction 2017 "Together We Can"
9:30 – 10:00am – Registration and pick up your t-shirt. Please bring non-perishable foods for our food drive. 10:45 – 11:00 – Cameron Gable – Short term exchange student talks about his time in Germany. 11:00 – 11:30 Scott Snyder – Talks about making homemade rocking horses for children of fallen heroes. Military, police and Fire. 1:15 – 1:30 – Jenna Kull, Emily Clark & Jasleen Gill – Their RYLA experience and how it helped her grow as a person. Doughnuts, Pizza, chips and water will be provided. We ask that each participant bring non-perishable food to donate to our local food bank. T-shirts designed by CFHS Interact will be given out to those who sign up by Friday, October 20th. This should be our biggest event this year; please sign up as many as you can from your club. Volunteers Needed at the Browns Game!! We will be selling 50/50 raffle tickets at the Cleveland Browns home games. These tickets will benefit Shoes and Clothes for Kids and help us at the same time! This is a WIN, Win!! (maybe not for the Browns). All ticket sellers must be 18 years of age or older. Ticket sellers will need to arrive at 8:45 am at the Browns stadium at the gate on the Northeast part of the stadium/ marked staff parking. Parking and meals are included for all ticket sellers. We will be done selling tickets by the beginning of the fourth quarter. Instructions will be provided the Friday prior to the game for all registered volunteers. You cannot volunteer unless you register in advance. 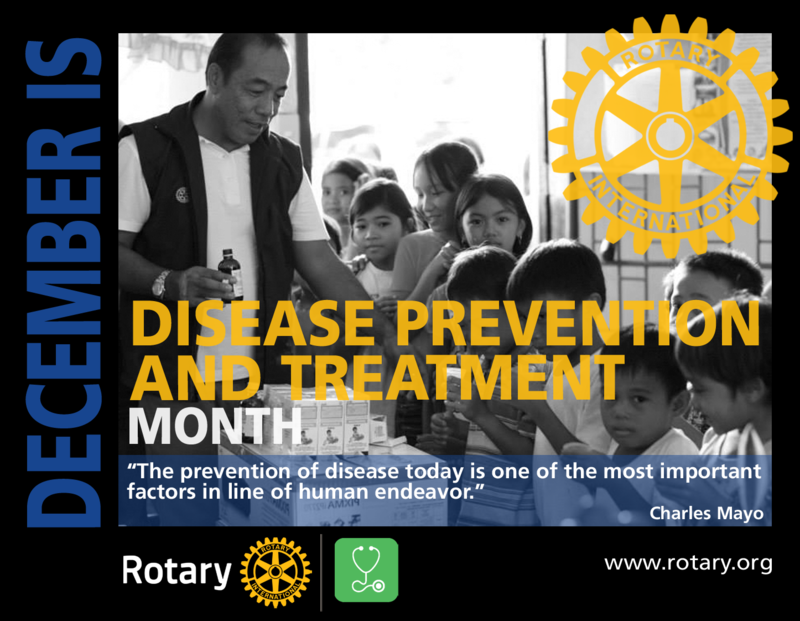 Please click here to enjoy this month's Rotary District Newsletter. Thanx to all of you who submitted content. Please be sure to include your name, club and business name on all documents submitted (except fliers) in order to get a byline shout out. The deadline for the September edition will be 9/23. .
Thanx to all of you who submitted content. Please be sure to include your name, club and business name on all documents submitted (except fliers) in order to get a byline shout out. The deadline for the August edition will be 8/23. All Rotarians are invited to attend the 2017-18 District Governor Banner Exchange. PDG Jim McKee will present and transfer the official Governor's Banner to DG Amy Kapostasy and the Mentor Club. Join the fun and fellowship at this annual event to support our outgoing and incoming Governor's. Another Rotary year has come to a close. Thanx to all of you who have assumed leadership rolls over the last year and those who will be stepping up this year. Also a special thanx from me to all those who have made this year's District Newsletters what they were by contributing to the cause. Please enjoy the last newsletter of the year (click to open). Here is the May Rotary District 6630 Newsletter(click to open PDF). Thanx to those who contributed. The deadline for the June edition will be 6/16. Written by District 6630 Historian Edward G. Thomas, this 148-page softbound book covers Arch’s life from his early boyhood in Conneautville, PA, through his life in Cleveland, OH, as a successful business man, a military enthusiast, an aspiring musician, a civic leader, an iconic Rotarian, and a dedicated family man. 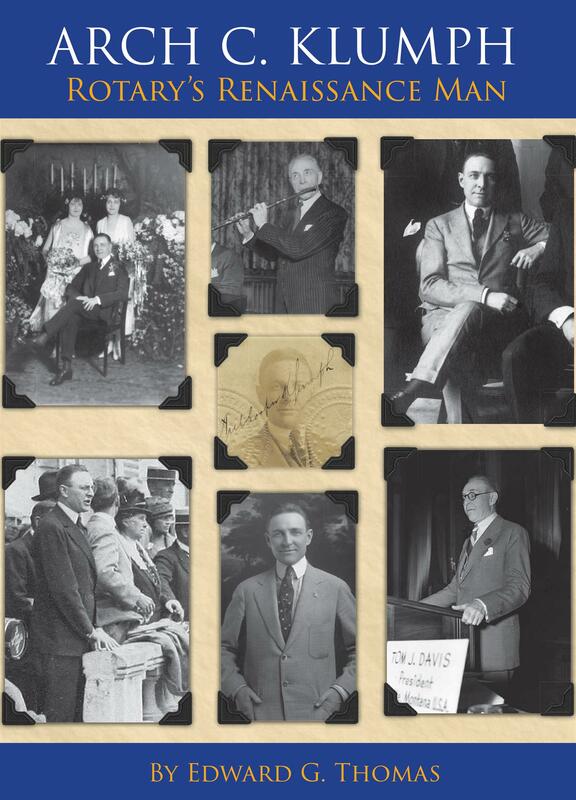 The book includes numerous photographs showing Arch at various stages of his life. Many of the photographs were provided by family members and have never been published before. Click to place your order now! in the domestic United States). This month's District Newsletter should be a quick read - click to open. Hope you enjoy it. My thanks to those who took the time to contribute. The deadline for the May edition will be 5/19. Thanx to all those that contributed. Please submit your articles for the March edition NO LATER THAN 3/17 THIS IS A FIRM DEADLINE THIS MONTH. Please enjoy the December Edition (click to open/download) of your District Newsletter (better late than never). Remember this Newsletter would not be possible without your Clubs' contributions. If your club hasn't submitted anything recently, we'd love to hear from you. If you are regular contributors, keep up the good work! The deadline for the January Edition will be 1/20. Here's wishing all of you and yours a Healthy, Happy and Prosperous New Year!! Please enjoy this month's District Newsletter; short and sweet (Click to Open). Thanx to all those who contributed this month. Maybe next month you'll send something too! The deadline to submit for December's edition will be 12/16. Please enjoy this month's Rotary District 6630 Newsletter (Click to Open). Thanx to all those who contributed. Keep in mind that the deadline to submit articles for the November Newsletter will be 11/18. Celebrate World Polio Day this October 24th! Advocate. Download the World Polio Day tool kit and join our worldwide network of End Polio Now advocates. Amplify. Show your support for the final push to end polio with our social media graphics. Connect. Host a community gathering to get everyone involved and tell us how you’re taking action—register your event. Give. Support volunteers and Rotary staff from around the world cycling up to 104 miles in El Tour de Tucson to raise funds for polio eradication. Hope you enjoy this month's District Newsletter. Simply click to open. This Newsletter would not be possible without your Club contributions. The cut-off for the October edition will be 10/21. Thanx and happy reading! Please enjoy this month's Rotary District 6630 Newsletter (CLICK TO OPEN PDF). Two special notes... Be sure to click on the links at the bottom of page 5 for all the Centennial Celebration Information you may need and on page 11 for District Governor Nomination Forms. Thanx to all who contributed. Have a safe Labor Day Weekend! The deadline to submit for the September Edition is 9/16. 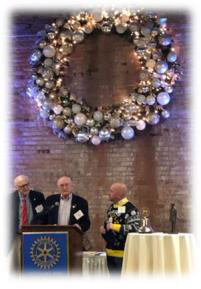 Please enjoy this last Newsletter of the 2015-2016 Rotary Year (click to open). Thanx to all who took the time to send articles and share what your Club has been up to. The deadline to submit articles for the July Newsletter will be 7/15. Please enjoy this month's newsletter. Thanx to all those who took the time to share what's going on. The deadline for the June edition will be 6/10. Please enjoy this month's Rotary District 6630 Newsletter. Thanx to all the clubs that provided content. The deadline to submit for the May Edition is 5/13. Please enjoy this month's newsletter (click to open). Thanx to all those who took the time to share what's going on. The deadline for the March edition will be 3/11. Make Your Club Meeting THE Place to Be!! Hope all of you Veterans got the recognition you deserved last week! This month's newsletter has a couple of articles written by Rotarian veterans. CLICK TO VIEW NEWSLETTER NOW! Please check out all the links from photos etc. Please note the clipart flag and cornucopia don't lead anywhere. Please remember that this newsletter is a vehicle by which all Rotarians and Clubs can share interesting items with the rest of the District. As far as I am concerned any Rotarian may make a submission (your club leadership may think differently so you may want to ask first). My requests for articles go to every member in the District's database so don't worry that I have contacted the wrong person from your club. The "right" person was contacted too. Just remember when submitting article to consider the readership... Would you find this article interesting if it came from a different club? Hope you enjoy the newsletter and have a happy and safe Thanksgiving... no premature napping at the dinner table! Enjoy this month's District Newsletter. Don't wait 'till the last minute to send in your articles for the October edition. Please enjoy this month's District Newsletter. Thanx to all for your submissions. Please have articles for the Sept issue to me by Aug 30th. Hope you enjoy this month's newsletter. To download and view the attachment, please click here. Please start sending me your submissions for the August edition. The cut-off for the August edition is July 30th. Be sure to click on the photos and graphics for links to larger images or even videos. The student bios on page 6 and 7 do not enlarge. Hope you enjoy this month's edition. Click here to read. Sorry to be so late! Be sure to click on the images for enlargements or links to interesting features. Please send your June articles as soon as you can. We would like to publish the June Newsletter in the first half of the month. And as always, THANX FOR YOUR CONTRIBUTIONS AND SUPPORT! Club secretaries, be sure to distribute to your Club's members! Please send your June articles as soon as you can. We would like to publish the June Newsletter in the first half of the month. And as always, THANX FOR YOUR CONTRIBUTIONS AND SUPPORT! Club secretaries, be sure to distribute to your Club's members! Click to view this month's newsletter. Also - my apologies to the members of TRC Bedford for not getting this flier into the April newsleter. Please Click Here and save the date for what promises to be a great event!!! Thanx to all of you who submitted articles for this month! Also thanx to the many Rotarians who took the time to comment on the new format of delivery for the newsletter, glad you like it. Club Secretaries, be sure to forward the newsletter to your members. I hope you enjoy the newsletter this month. Keep sending information for upcoming publications to Mike Johns Jr. Click here to view this month's newsletter! Hope you enjoy this month's edition - Click here to open! Please be sure to submit articles for the February edition as close to my Jan 23rd deadline as possible. Remember, there is no newsletter without YOU! Also please be sure your club has updated all the email addresses (and other info) in the club executives sections on the District Website. Finally, Club Secretaries, be sure to forward this newsletter to all of your members. Thanx for your help again in making this Newsletter possible. Greetings Rotarians. I hope you enjoy this month's newsletter. CLICK HERE and be sure to move your cursor over the graphics and photos as they will take you to larger images, videos and other interesting places. While looking at the Rotary video on YouTube (another link) be sure to sign up for a subscription to Rotary's own YouTube Channel. That way you can receive new videos as they are released. Please remember to distribute this and every newsletter to the rest of your club every month as I only have access to specific members (officers) of your clubs. Also be sure that all your email info for officers is in place under the define club executives section on the District Website. Click here and enjoy this month's newsletter. For those of you who are receiving the newsletter for the first time, be sure to move your cursor over the graphics as they will take you to larger documents, videos and other interesting places. While on the RI website be sure to sign up for the electronic newsletters that RI offers. You can also go through member access to set up this and other great features. While looking at the Rotary video on YouTube (another link) be sure to sign up for a subscription to Rotary's own YouTube Channel. That way you can receive new videos as they are released. Please remember to distribute this and every newsletter to the rest of your club every month as I only have access to specific members (officers) of your clubs. Also be sure that all your email info for officers is in place under the define club executives section on the District Website. Finally remember that my PUBLISHED Deadline for article submissions is the 23rd of the month for the next month's edition ie July 23rd for the August Edition so please start submitting articles for that newsletter as soon as possible!! Just use this as your guide... If another Club submitted this article, would I find it interesting? Typically you should expext the Newsletter about mid-month. Please enjoy this month's newsletter... be sure to find the links (just click on graphics). Click here to read the April Newsletter for District 6630. Enjoy!! 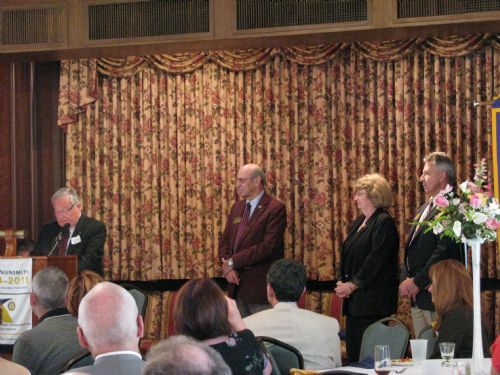 Governor John Bosco made the announcement at the District Assembly that t he nominating committee has selected James Lechko of the Rotary Club of Lakewood-Rocky River to be the District Governor for 2012-2013. Please click here and enjoy this month's District 6630 newsletter. These 10 charities work throughout the country and the world. They are large, complex organizations with budgets exceeding $100 million, and at least $65 million in net assets. Interact Video Contest 2012: Past, Present or Future? Submit your entry by 3 December 2012. Read the official rules (http://tinyurl.com/interactvideocontest) and fill out the online entry form (https://rotary.qualtrics.com/SE/?SID=SV_0Dm2wyoizUFCSgJ) when your video is read to submit.